Do you do your best to avoid GMOs in food by reading labels and only buying from trusted brands? Well how would you feel if you found out that a popular brand of tortilla corn chips that you’ve been buying – specifically because their packaging states they are GMO-free – was FULL of GMO corn? Yea, you’ve been eating those tasty little chips like they were going out of style, all while potentially hurting yourself without even knowing it. That is exactly what’s happening with tortilla chip maker Xochitl, a company recently ousted for covertly including GMO ingredients in its chips. Xochitl has been printing the GMO-Free label on the bottom left on their packages, branding themselves as a label that consumers can trust. However, after conducting a study looking at many products that are supposed to be GMO-free, Consumer Reports, has found this labeling to be less than honest. Consumer Reports says that Xochitl has been lying about their GMO content – and not just a little bit. We aren’t talking about trace amounts of GMO corn. The report even found its way into the mainstream media. Despite the non-GMO claims by Xochitl (pronounced “so-cheel”) and their Totopos de Maiz original corn chips, the Consumer Reports investigation found that the non-organic (supposedly non-GMO) varieties of the chips contain over 75% GMO corn, after testing 6 different packages. GMO corn was found in each type of chips, even with the ‘all natural’ and ‘No GMO’ claims on the front and backs of packages. The Xochitl finding raises an important question about the unverified, non-third party claims of companies trying to sell their GMO-containing products. It also makes the suggestions of the Grocery Manufacturer’s Association that we should just trust food manufacturers to ‘voluntarily’ label their GMOS without independent verification and government mandated labeling even more ridiculous. The report, which can be read in its entirety here, states that the majority of samples from companies that make unregulated non-GMO claims contained about 0.9% GMO corn or soy on average. Xochitl just happened to grossly overstep that average. So, even though looking at packaging can help you to minimize GMO consumption (as most non-GMO advocates have been saying for years), it is going to be more and more difficult to find truly non-GMO products unless they are sourced outside of the US. as so many of our crops are contaminated with genetically modified seed. It is also vital to note that “All Natural” products had comparable levels of GMO corn or soy to their “conventional” counterparts according to Consumer Reports; in other words, the “All Natural” label is virtually meaningless if you want to avoid GMOs. Though it is understandable that food companies would want to present their products as GMO-free since over 96% of Americans want their food labeled so they can avoid the stuff, producing a product and selling it to national grocery store chains all over the nation with a false ‘NO-GMO’ brand is unconscionable – and illegal. Their website, not just their brand packaging, states this claim. If we continue to fight against this trend, I do think we can win. After all, several multi-million dollar lawsuits against Coca-Cola – makers of Vitamin Water, and Tropicana – for claiming their products were ‘all natural’ when they were not, have been won. We are, in fact, the largest GMO-producing country in the world. Over 90% of the soy we grow and 90% of our corn is now genetically modified. Please, adjust your grocery shopping habits according to this information, and of course let Xochitl know just how you feel about their fraudulent practices on their contact page here – their Facebook page will no longer load. I wrote an eight page report on why GMOs are not harmful to the human body or the environment. Despite the facts, however, no company should be getting away with printing blatant lies on their packaging, regardless of how silly the matter might be. Great! Now I can’t find these chips anywhere. Thanks a LOT “Natural Society” !!! Now I’m going to die of high blood pressure or a heart attack since NO ONE else seems to sell salt free tortilla chips, especially at a reasonable price. My blood pressure is on your hands! 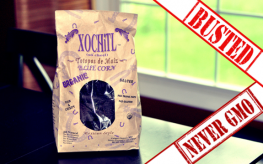 If Xochitl has been flatout falsifying its non-GMO claim as alleged, the CEO needs to be thrown in prison. What they’ve done illustrates the “Anything goes for the sake of the Almighty Dollar” mentality that prevails in corporate America. Speaking of fraud, have you ever wondered why if 80-90 % of Americans say they want GMOs to be labeled, that the labeling laws keep losing in various states ? The best way to enact labeling laws is through state legislatures, so contact your senators and representatives in your state and demand action now. CVF is also easy to stop. its finest…and hardly any federal politician will endorse this idea. Where does it say 75%? The only number I can find in the report is slightly higher than 0.9% found in the corn chips. Big difference. So, I hate to say this, but I laughed a little when I read this. I’ve seen these but never bought because the package looks weird and I can’t pronounce the name.I filed them same as ingredients I can’t pronounce – If I can’t pronounce it, not going to trust it. I have contacted them and gave them my livid piece of mind. No longer buy tell everyone. Thx natural news! Very much appreciate this report….always good to know for sure if a company is honest in its labeling. Its something I have often wondered about. That being said the actual report was specific in which Xochitl corn chips were GMO. It was the product labeled Natural and GMO free. The Xochitl Organic corn chips were in fact GMO free according to Consumer Reports so the picture at the top of the article is incorrect. It shows the Blue Corn Organic corn chips. 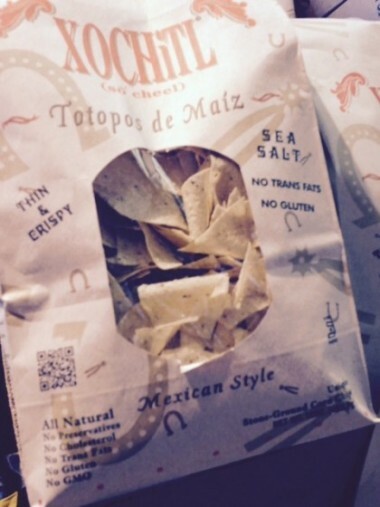 Now I am not by any means endorsing any Xochitl product…I think what they did was reprehensible. I am just suggesting that the author change the picture at the top of the article to maintain the integrity of the information. It would seem that the only way to be completely safe from consuming GMO products is to avoid products with the potential for GMO ingredients. I am mad as HELL! I thought I could trust this company! And yes, I buy their blue corn chips! I do everything possible to avoid GMO poisoning! I have kidney and liver challenges, no wonder my GFR lab test results went down recently when I am vigilant about what I eat! I would like to be part of a class action lawsuit against this company! Thanks Natural Society for all you do to keep the public informed and for saving my life! Never more with Xochitl!!!!!!!!!!! AAAAAAAAARGH!!!!!!!!!!! See the following video and website that produced it for the most critical information you’ll ever see: https://www.youtube.com/watch?v=TvieFJhJFK0&list=PL3561DAA7AAB9259A They also have a highly informative and truly balanced news section. In fact its where I found the link to this article from Natural society. The full collection of material they make available is the most powerful and compelling information in the whole world. This will change your life. I guarantee that you have never seen or will ever see information like this anywhere else. I’ve already watched it many times. It is really powerful and compelling. Now, I fully understand the true Catholic, the Traditional Catholic and outside of which there is absolutely no Salvation. This is frightening! I avoid all yellow corn at all costs and I of course avoid corn syrup etc but I have eaten the blue corn chips which to my knowledge are non-GMO. Please do an article on the blue corn chips. My big question is can the blue corn chips be contaminated with GMO yellow corn for instance? Please write an article addressing the concern thanxs! This type of lieing is defrauding the public! A Punishable crime! The company needs to be boycotted for sure! We the people need to be intolerant to this type of deception! Boycott ?! Let’s TAR & FEATHER THEM. Make an example to anyone else OPPS I forgot we the people can’t do that anymore and these lying scumbags get to continue to rack in the money!